Like many others I had always fancied swimming the Solent. While taking my two girls swimming at West Wight Sports Centre once a week I started to enjoy my swimming again. When I was a lot younger I had been a member of Seaclose Swimming Club and had a achieved my 5000m badge but had since always found other things a priority and hadn’t done any serious swimming for years. 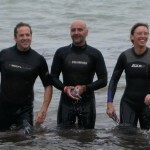 One thing led to another and then one night out with friends a few of us decided to sign up for the 2012 Solent Swim. Having been a good swimmer in the past and regularly getting in the sea surfing I was a little too confident and didn’t take my training seriously enough. When it came to the day for the 100 lengths at West Wight Sports Centre pool I suddenly realised that my pace was a lot slower than others. When I completed my 100 lengths the lady counting my lengths joked that I had been slower than her for my first 30 lengths. My 100 lengths of the pool was completed in 1hr 12mins. At least I had made it within the required time limit. 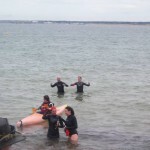 It was the kick up the derriere I needed and I spent the next couple of weeks getting a lot more swimming in along Totland sea front with my swim partner Liz Lloyd. Liz was brilliant, giving me lots of encouragement and I soon felt fitter and stronger. I also joined Darren Burgess for a swim across Freshwater Bay with a little bit of swell coming in to get us used to what it might be like out in the Solent if it was a little rough. The day of the swim came round quickly and before we knew it we all up early (about 5am) on July 15th checking the West Wight Sports Centre Solent Swim website to see it was on. At 06.25 am we all at Yarmouth Harbour Office and with a last safety briefing we were loaded into boats and taken over to Hurst Castle. 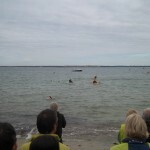 Each pair of swimmers had a kayaker as support and the kayakers had set off earlier to paddle across to Hurst Castle and were waiting for us when we arrived. Liz and I were numbers 1 and 2 so were to be first to set off. 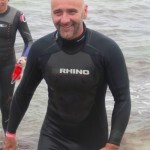 I was very nervous but also really looking forward to swimming the Solent, something I had wanted to do for many years. After a short wait for the tide our numbers were called out and we were off. A huge cheer from all the other swimmers and kayakers was great encouragement and it seemed like we were out swimming in the middle of the Solent in no time. We were initially told to head for Fort Albert as by the time we got near to it the tide would take us back into Colwell. I don’t know if it was all the extra training we had done in the last weeks or just adrenaline but when we got close to Fort Albert it felt as if we were swimming against the tide. We had swum across the Solent in a much quicker time than my 1hr 12mins in the pool suggested I would do it in. Luckily it wasn’t long before we could feel ourselves getting closer to Colwell where the was huge crowd awaiting for us. I had been told that you would know when you were getting close to Colwell when you could smell the bacon cooking for our butties. Sadly there was little wind and I never did smell the bacon but it did spure me on. Walking up onto the beach at Colwell with that huge crowd cheering everyone on was amazing. It was an experience I will never forget and hope that one day I can be apart of it again. 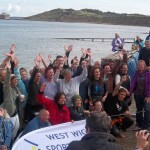 The Solent Swim was started a few years a go by West Wight Sports Centre. 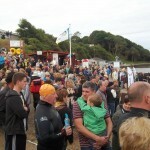 The sports centre is a registered charity and relies on fundraising events like this and all the volunteers who without their help the swim would never happen. This entry was posted on Monday, November 19th, 2012 at 11:39 am. It is filed under The Present Day. You can follow any responses to this entry through the RSS 2.0 feed. 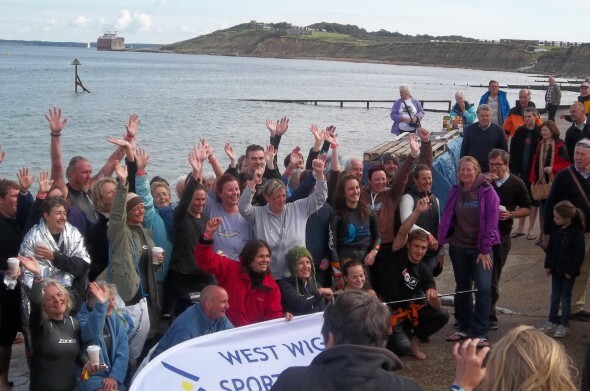 Never in a million years could we have dreamt this event would have been so succesful – the 70 amazing swimmers have now raised over £30,000 this year. Over the 2 years that we’ve run the event we’ve raised £54,000. 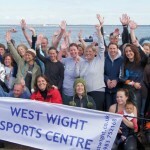 Some has gone to other charities but £47,000 has been raised for West Wight Sports Centre – truly awesome!